After months of denying having a hand in the Ukrainian coupe, US President Barack Obama admitted playing power broker for the “transition.” This probably falls short of America’s actual involvement. Some of the money went into sponsoring various NGOs, political parties and media outlets. For instance, Hromadske.tv, an internet-based television channel created in summer 2013, received a grant of some $50,000 from the US embassy. The channel provided full-time coverage of the Maidan protests and gave a platform to various opposition figures. Such funding is a well-known tool of the American government. Washington describes it as promoting a positive change and denies accusations that it gives money to get leverage to pursue its own goals in targeted countries. But in Ukraine US officials played a far more prominent role than simply funding local players. Some like film director Oliver Stone even call it a US-staged coup, while former US Congressman Ron Paul called for the US to stop meddling in Ukraine. A parade of Western officials descended on Kiev to support the protesters and discourage President Viktor Yanukovich from taking tougher measures against them. One vocal star of the US political stage, Senator John McCain, enjoyed an evening with opposition leaders and tweeted photos of the crowds in the square. He went on to address the protesters the next day. Nuland herself is probably most remembered now for handing out cookies to riot police officers and demonstrators, while on a November 2013 Maidan tour accompanied by Ambassador Geoffrey Pyatt. Behind the scene, the duo were engaged in power brokering. In January, it was Pyatt who made radical protesters withdraw from the Ministry of Justice building, which they had previously seized by force. Ukraine’s Interior Ministry, then still loyal to Yanukovich, officially thanked the ambassador. Later in February, a leaked phone conversation, notable for Nuland’s unprintable expletive at her frustration with the EU, revealed the pair discussing who should lead the new Ukrainian government (Arseny Yatsenyuk, incidentally, the current PM) and who should not be in it (Vitaly Klitchko, currently mayor of Kiev). The US government’s support for the post-coup government in Kiev never dwindled even as it went on to encroach on media freedom and the free speech and launched a military crackdown on its dissenting eastern regions. At times, critics say, it was difficult to distinguish the new Ukraine from an entity directly ruled from Washington. One ironic episode occurred in December, when the Ukrainian Security Service building flew a US flag alongside a Ukrainian one over its entrance. Photos of the flags were quickly dismissed as a propaganda fake by Ukrainian bloggers, but the SBU later confirmed that it ran up the stars and stripes to honor visiting US Under Secretary Rose Gottemoeller, who is in charge of arms deals with the State Department. The debate over the flag was partially fuelled by rumors in Ukraine that the SBU allocated an entire level in its HQ to US consultants, including active CIA agents. The rumors may be insulting to Kiev’s sovereignty, but there could be some substance behind it. Ukraine didn’t hesitate to appoint several foreigners as ministers, hastily giving them Ukrainian citizenship necessary for the jobs. Among them is Finance Minister Natalie Jaresko, a former section chief at the US embassy and chair of an investment fund, which distributed US Congress money provided thorough the US Agency for International Development (USAID). 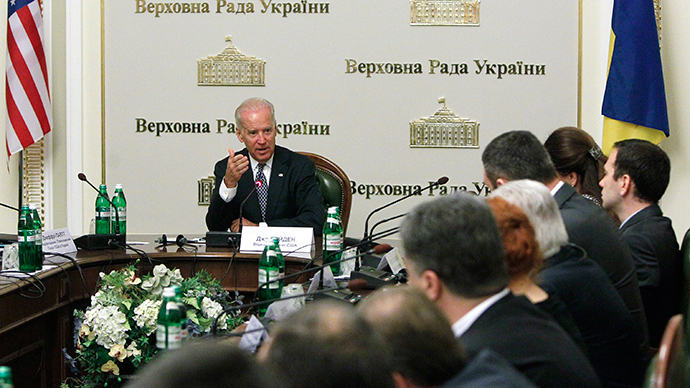 A similar episode transpired in April, when US Vice-President Joe Biden arrived in Kiev on a state visit. The top American official came just after then-acting President Aleksandr Turchinov had declared the military campaign against the rebel forces in Donetsk and Lugansk regions was active. This later escalated into a full-fledged civil war. For Biden, Ukraine’s economic future is a matter of concern not only due to his office but also due to his family’s ties with the Ukrainian energy sector. In May, Ukraine’s largest private gas company, Burisma Holdings, announced the appointment of VP Biden’s son, Hunter, to its board of directors. The White House insisted the appointment posed no conflict of interest for America’s second-ranking public official. These and other examples of US “power brokering” raise some doubt about Washington’s claimed distance from the regime change in Ukraine. After all, the US has a long record of meddling in other countries’ affairs, ousting governments Washington didn’t like and imposing those it did. Why would Ukraine be any different, skeptics ask?